During the early 1970s, the two large countries at either end of the Pacific shaped the restless world in their own ways. China was moving full steam ahead on the Cultural Revolution. The U.S. was grappling with a series of domestic and international problems including the Vietnam War. Mired in ideological opposition, U.S.-China relations had been hostile since the founding of the People’s Republic of China in 1949. Getting these Cold War foes to reconnect with each other looked like a mission impossible. Curiously, Ping-Pong emerged to play an important role in bringing U.S.-China relations to rapprochement in the early 1970s and finally to normalization in 1979. The historically significant Ping-Pong exchanges between China and the U.S. held in 1971 and 1972, which came to be called “Ping-Pong Diplomacy” (乒乓外交 pingpang waijiao) in English, were nicknamed xiaoqiu zhuandong daqiu 小球转动大球 (small ball spins the big globe) in Chinese. Unbeknownst to many, Michigan played a key role in the 1972 exchanges. 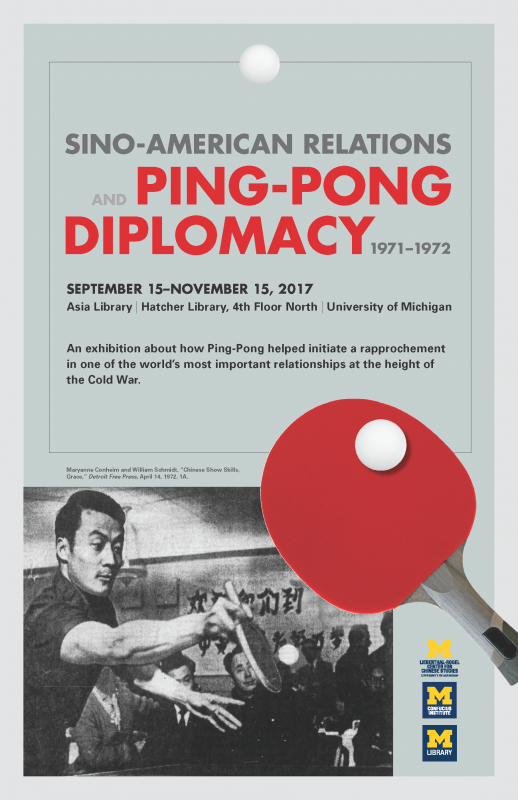 Featuring an authentic Ping-Pong-table-sized panel that details highlights of these exchanges, this exhibition commemorates the 45th anniversary of the Chinese Table Tennis Delegation’s historic visit to the U.S. in 1972, especially to Ann Arbor and the U-M. Curated by Chinese Studies Librarian Liangyu Fu, this exhibition is co-sponsored by the Lieberthal-Rogel Center for Chinese Studies, the Confucius Institute, and the Asia Library.